A three-bedroom home can be the perfect size for a wide variety of arrangements. Three bedrooms can offer separate room for children, make a comfortable space for roommate, or allow for offices and guest rooms for smaller families and couples. 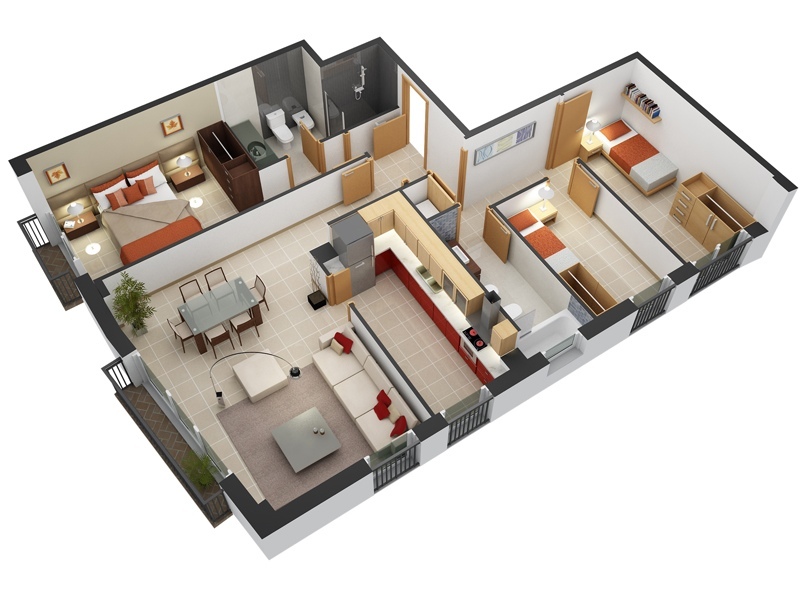 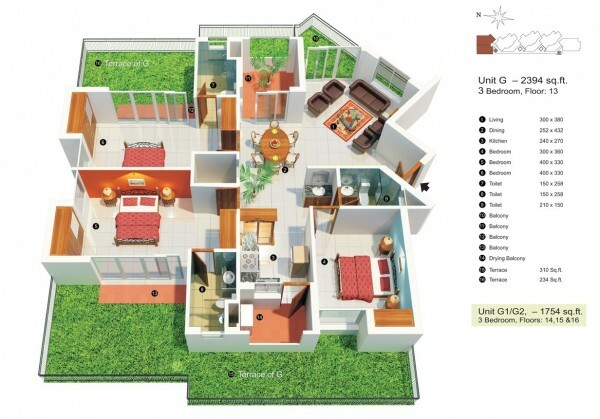 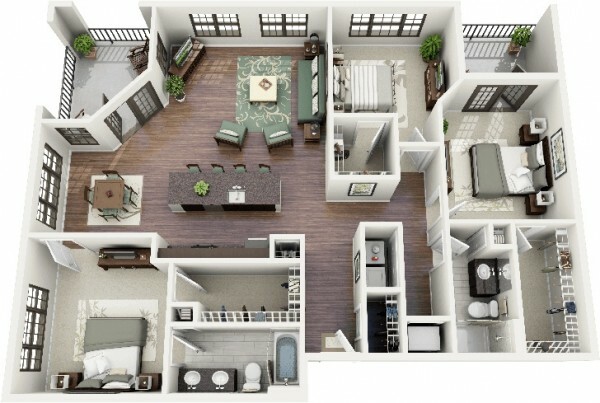 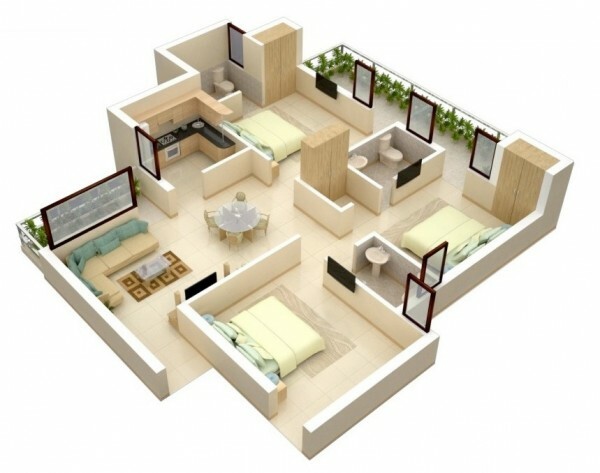 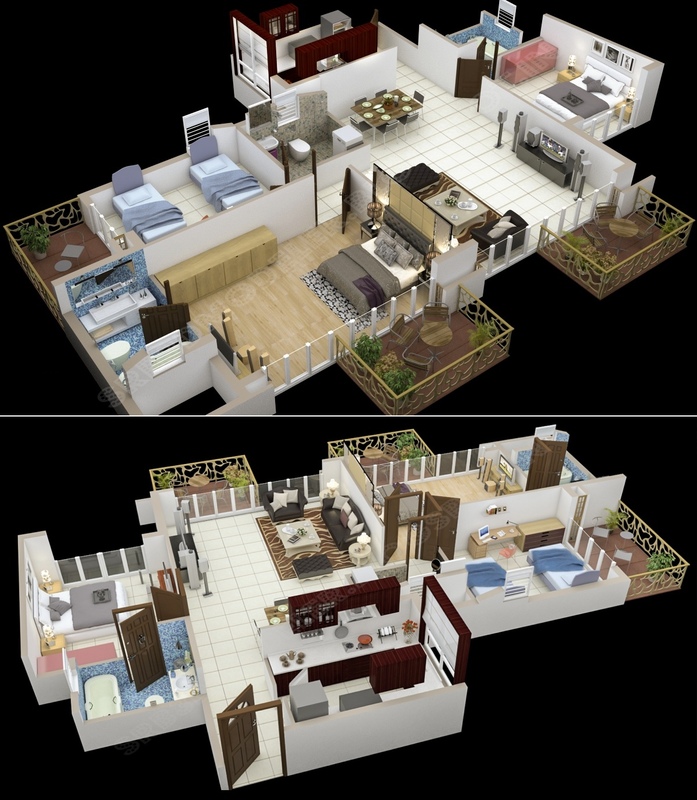 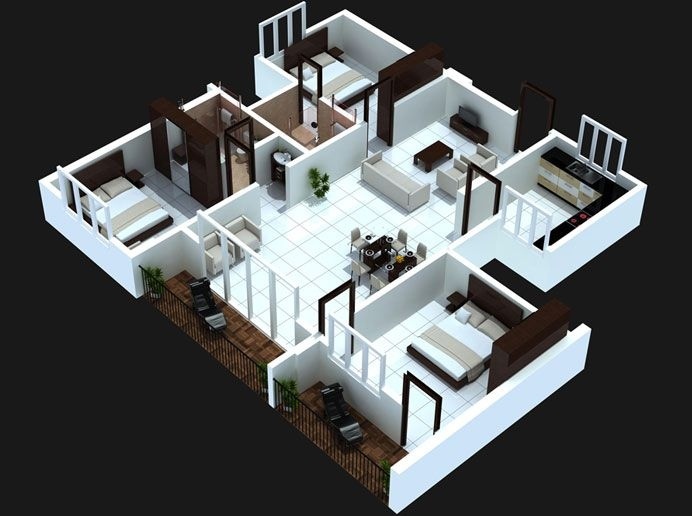 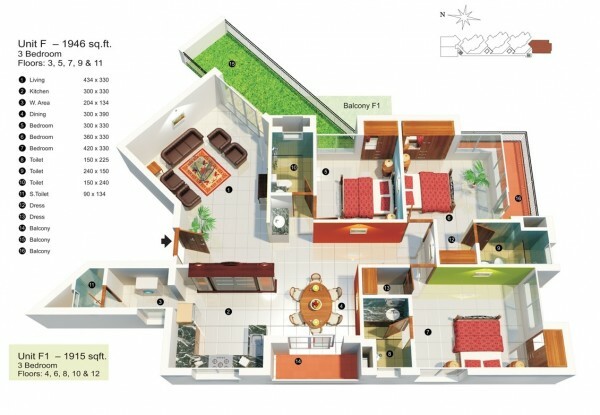 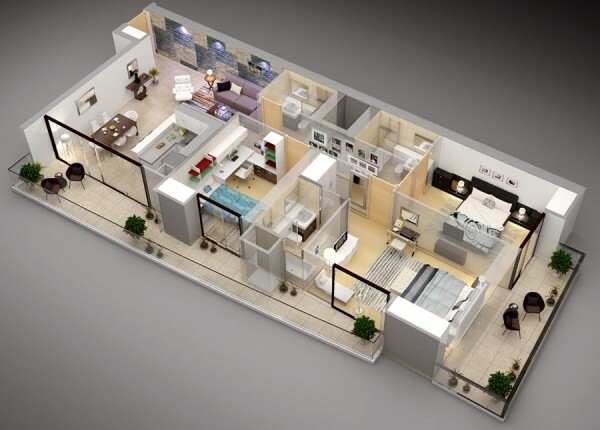 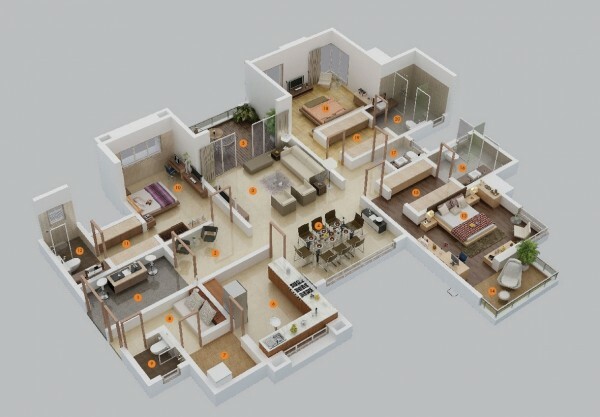 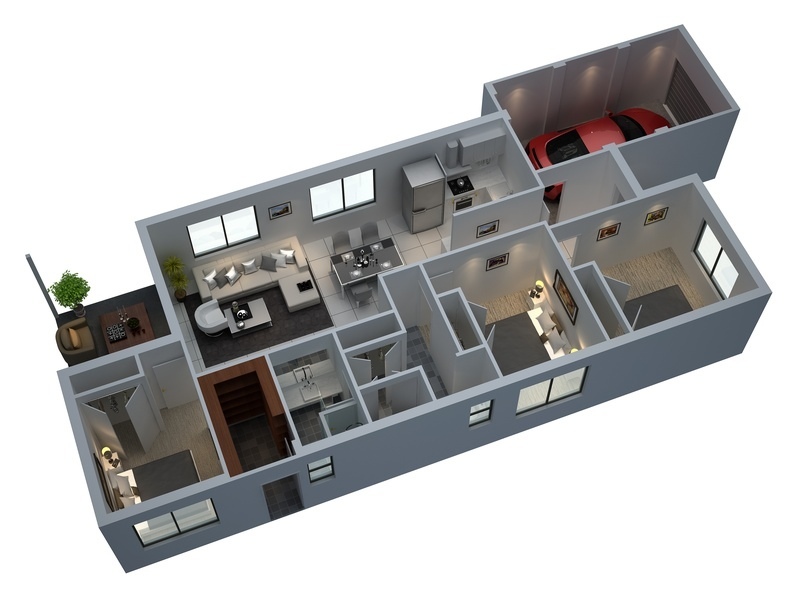 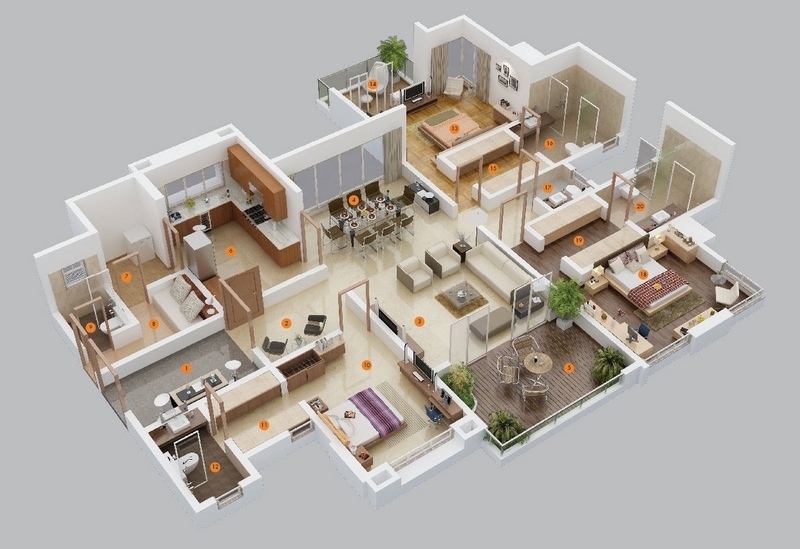 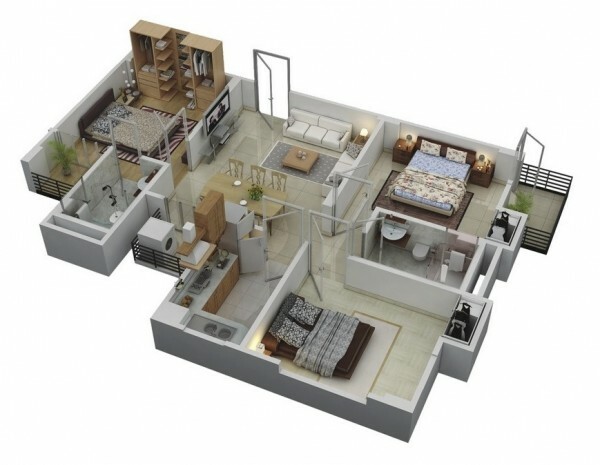 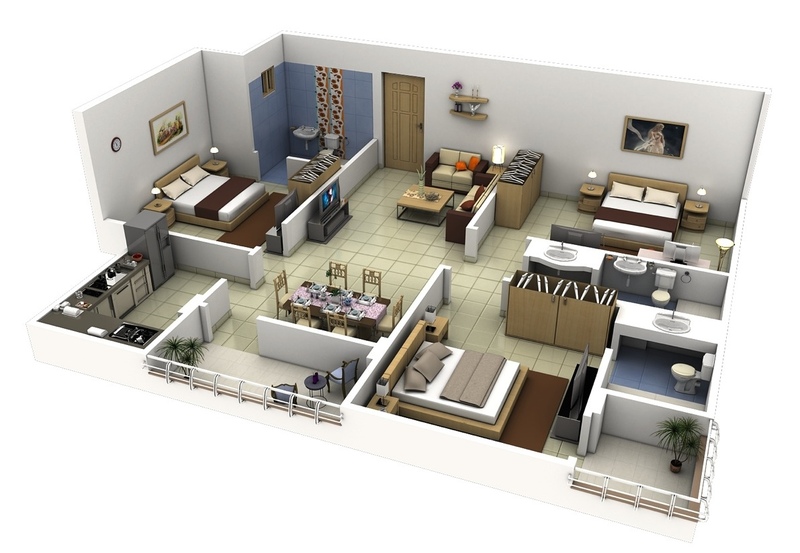 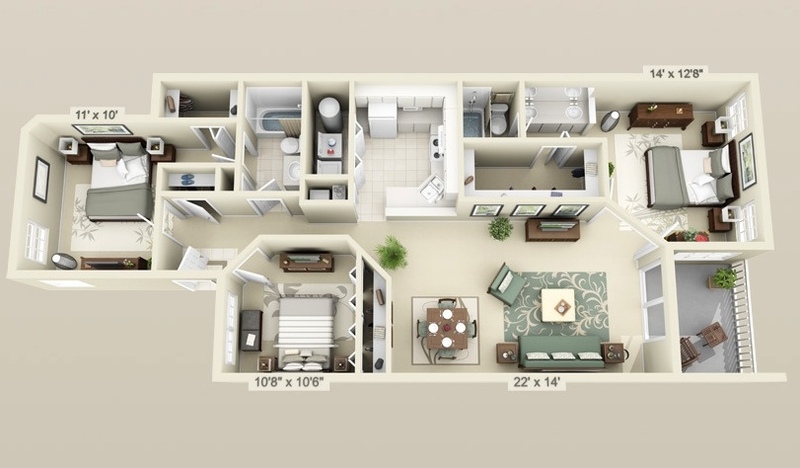 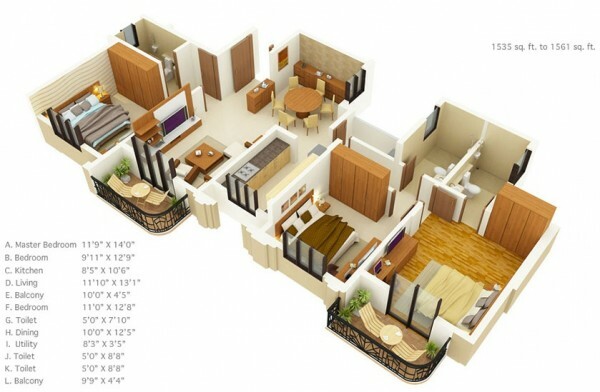 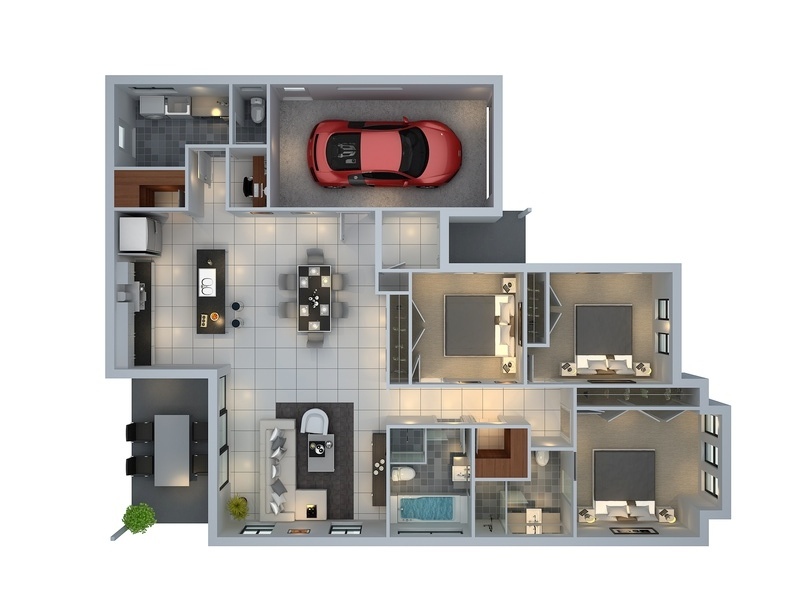 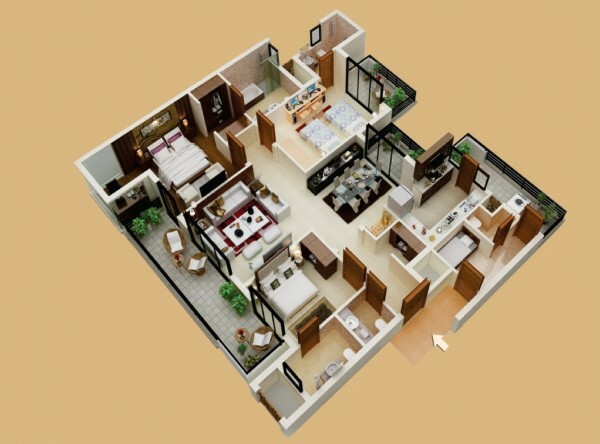 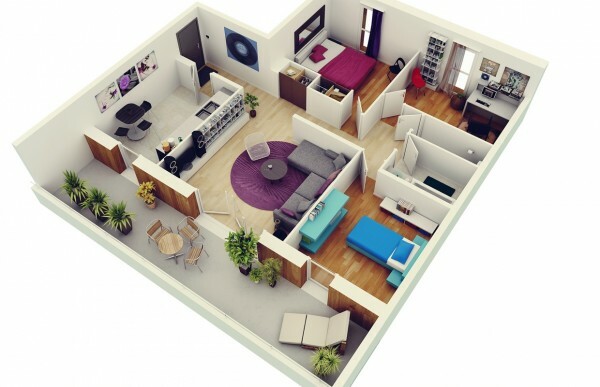 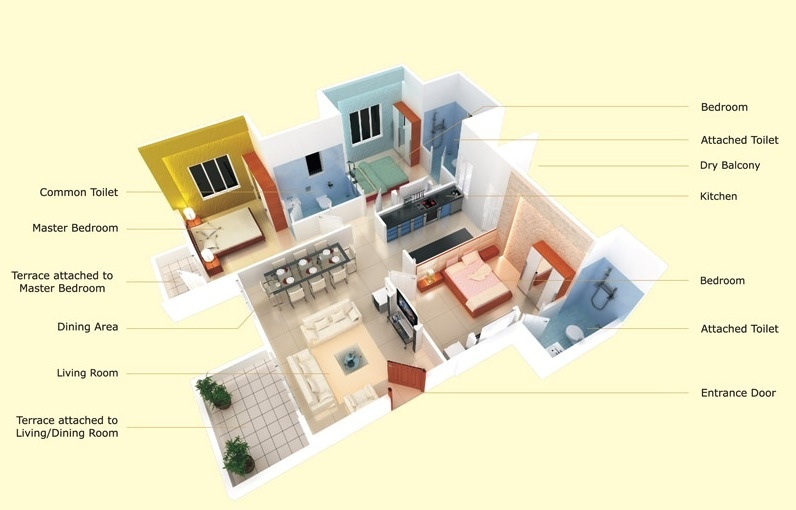 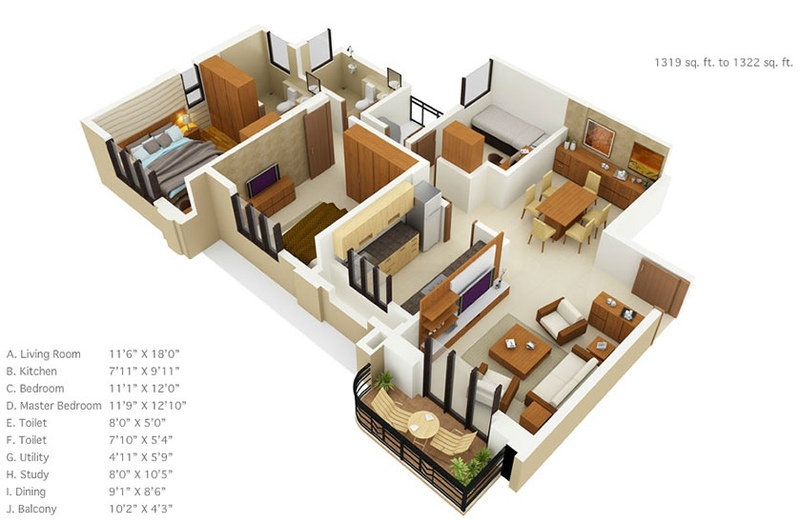 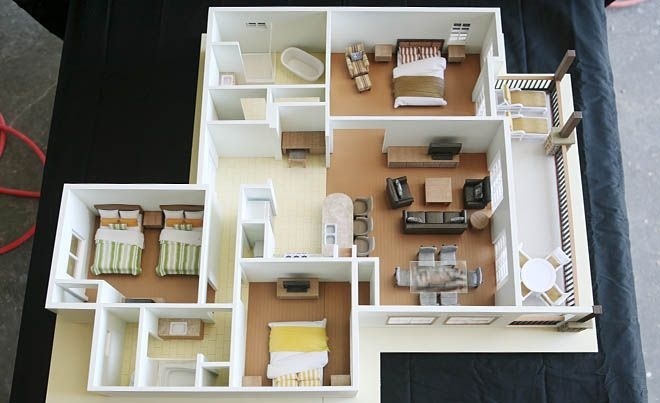 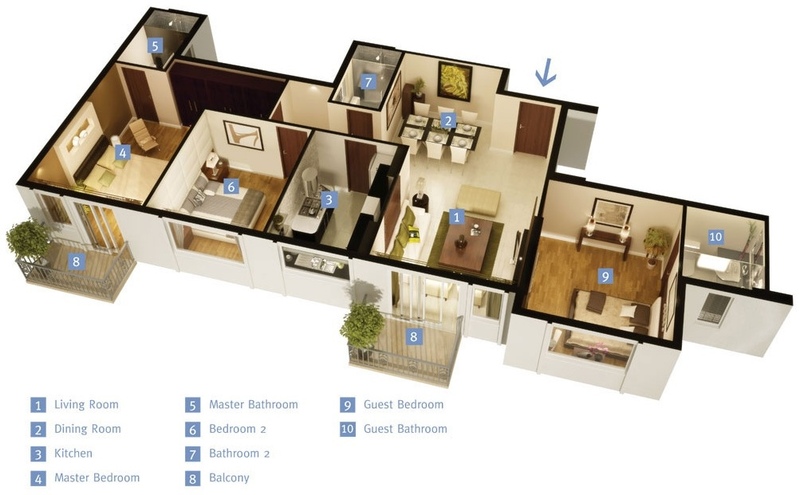 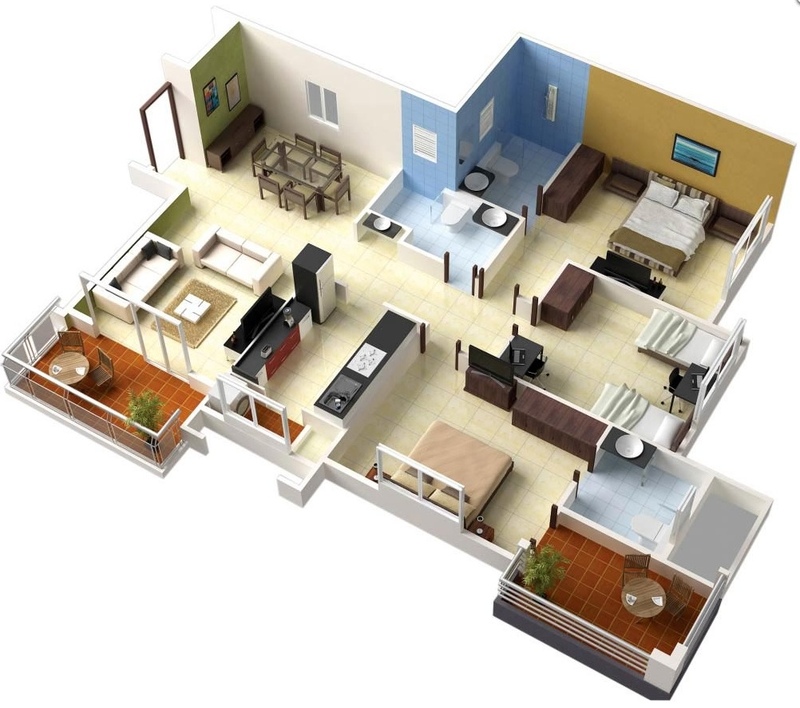 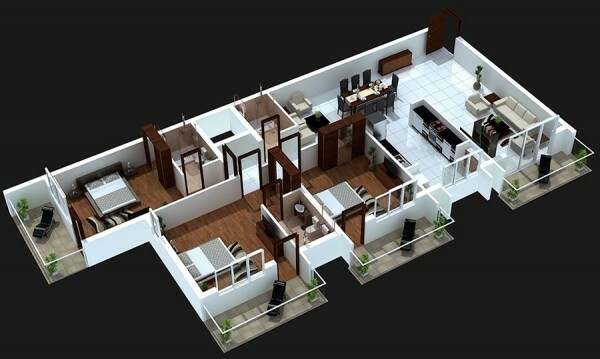 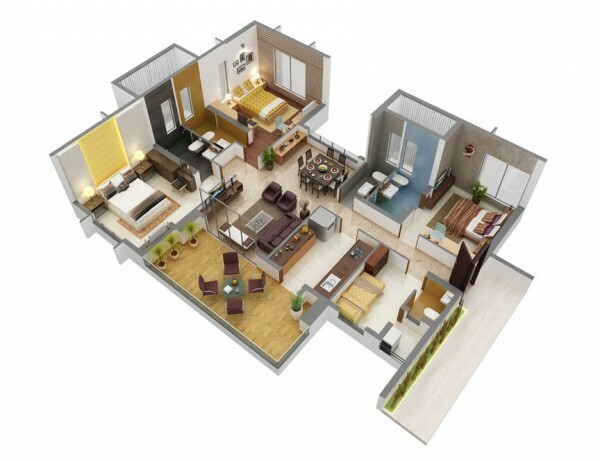 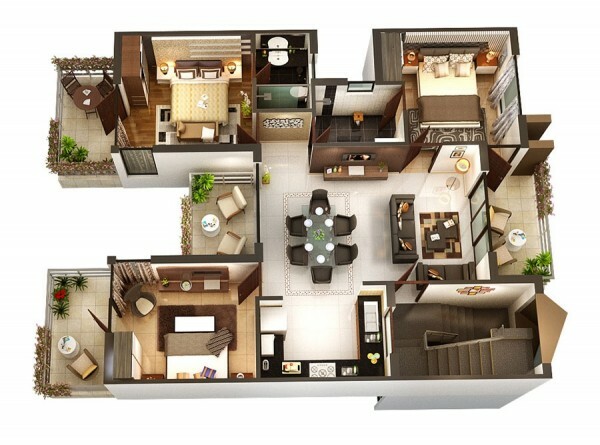 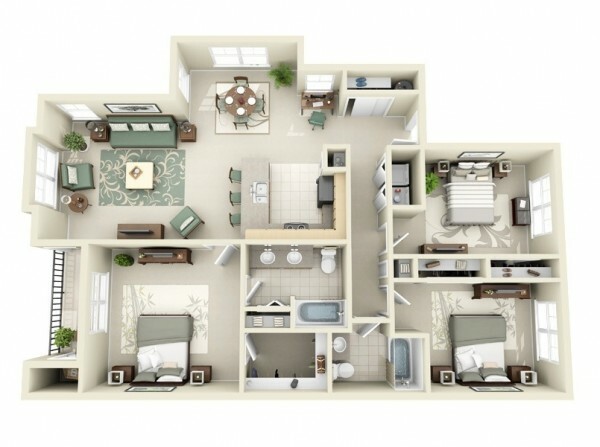 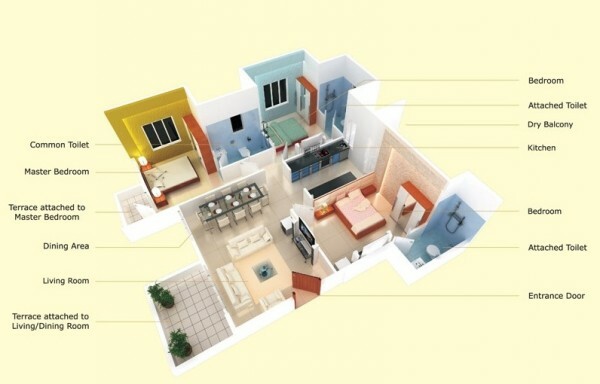 The visualizations here show many different ways that three bedrooms can be put to good use with stylish furnishings and unique layouts. This colorful home would be an ideal choice for music lovers, featuring two bedrooms and a spacious living area, complete with music storage and stereo, that opens out onto a cozy veranda. 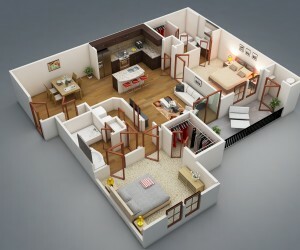 A small kitchen and an office area complete the comfortable home. 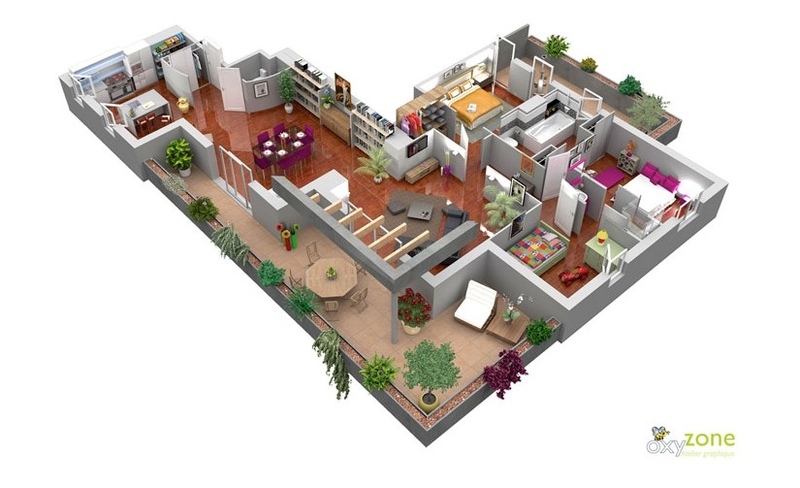 This three bedroom house fully embraces a natural aesthetic. 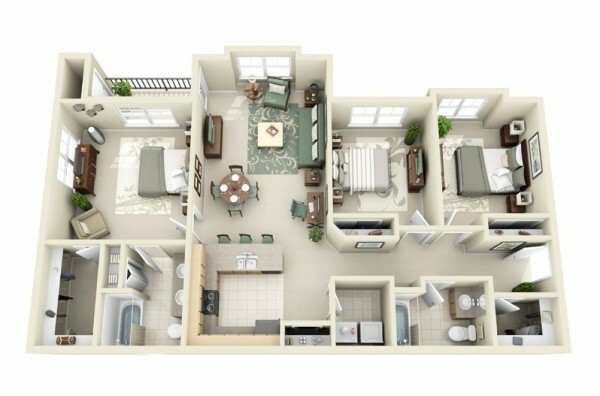 Not only does it use neutral browns and grays throughout, it features four separate outdoor patio areas. 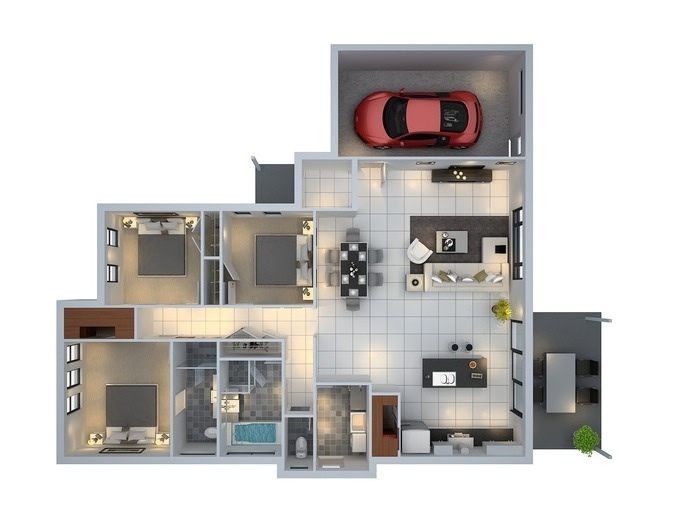 In a spacious design that would be perfect for roommates, this three bedroom house includes private baths for each room and a separate guest bath in the front hall. Outdoor lounging areas complete this modern, luxurious layout. 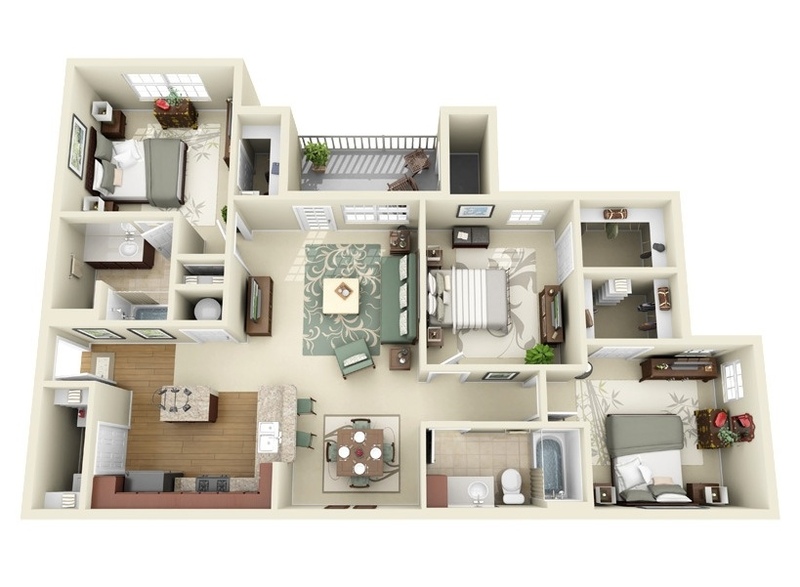 Another three bedroom layout from Astin Studios turns the largest bedroom into the lap of luxury with white marble floors, a conversation nook and a walk-in closet. Working with a small space than some of the other designs in this round up, this three bedroom apartment still has all the trappings of a comfortable, modern home. A Jack and Jill bathroom makes a perfect option for siblings with the master bedroom has it’s own bath and walk-in closet. 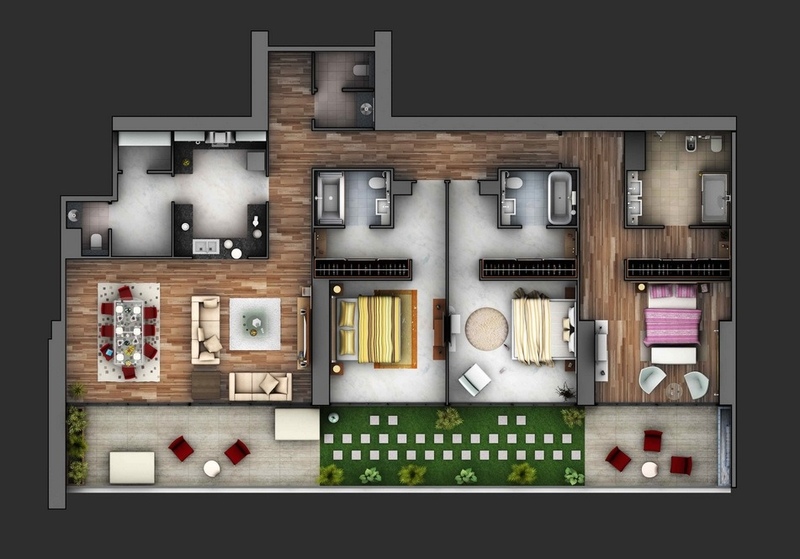 The kitchen includes a breakfast bar as well as a dining area. 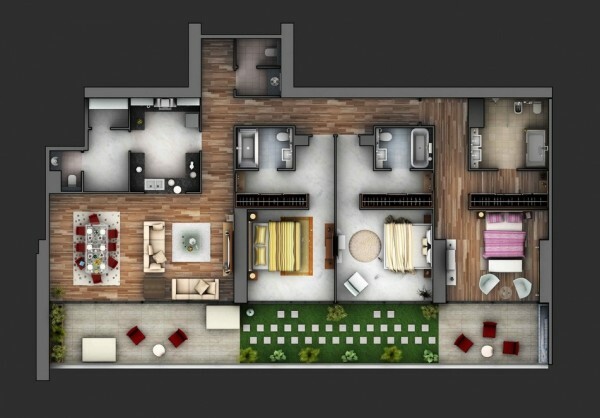 Once again, outdoor spaces are key to this three bedroom design. 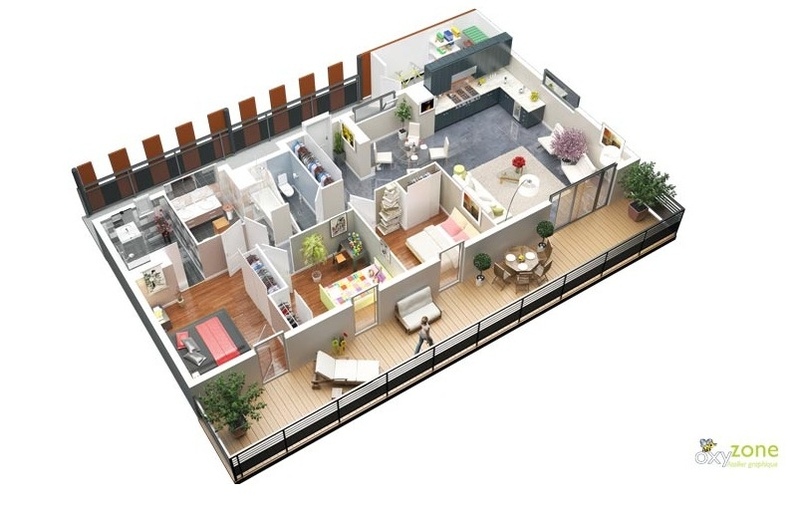 Decks running outside two sides of the home give many relaxing options while the bedrooms are cleverly arranged to leave space for work areas and storage. This beachy design uses white and sea foam green to immediately transport you to Cape Cod or another seaside town. he bedrooms are not large, but the centralize living area and patio leave space for ultimate relaxation. 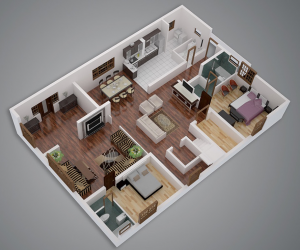 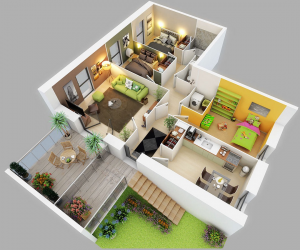 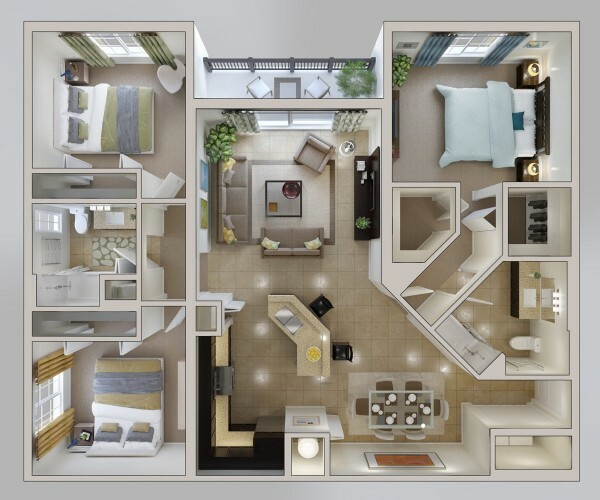 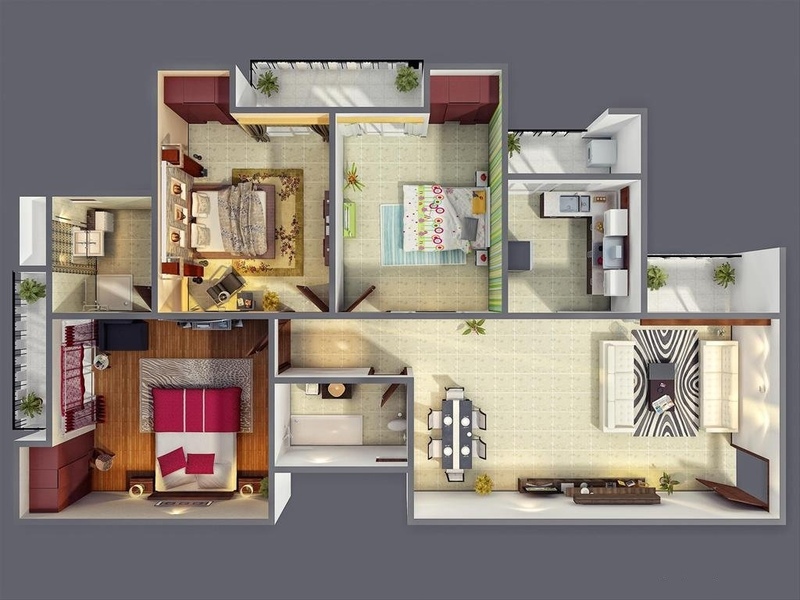 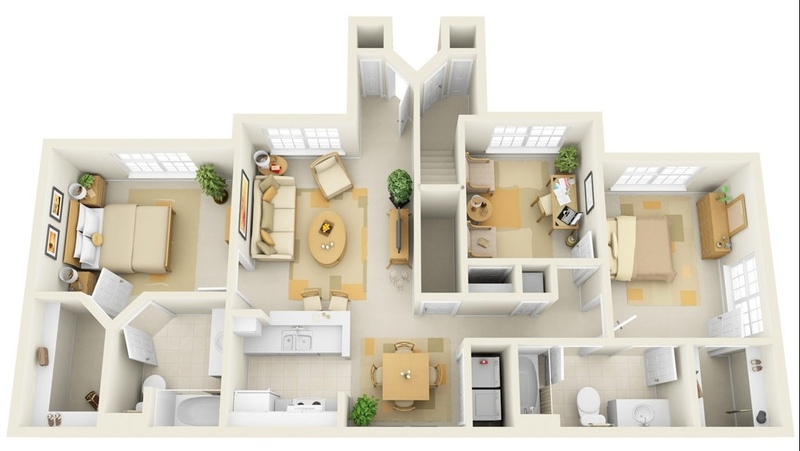 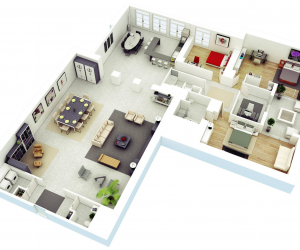 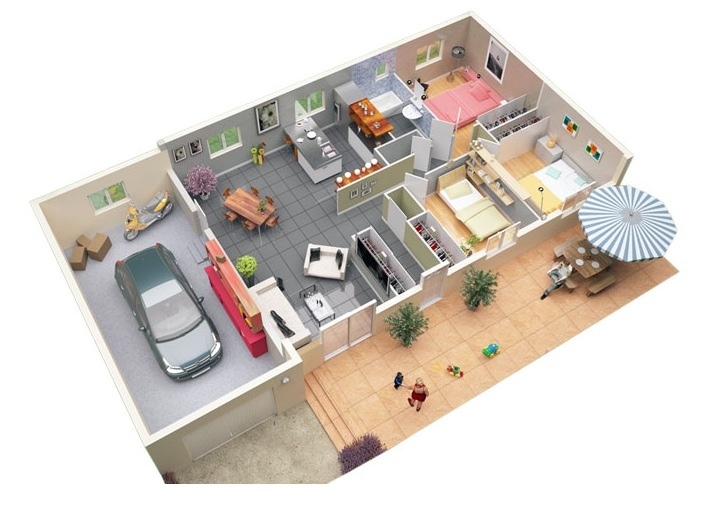 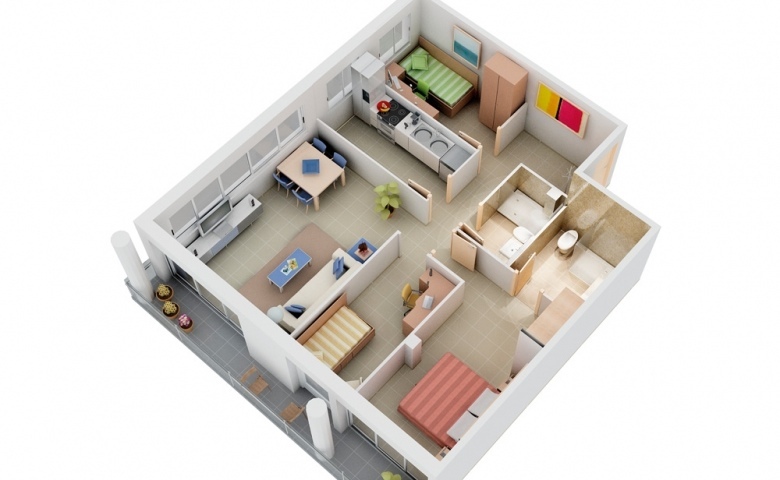 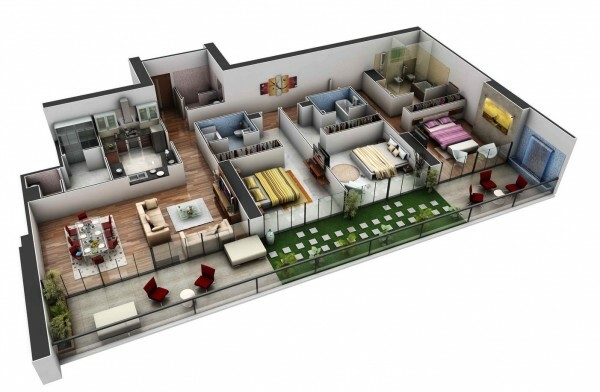 Proving you do not need square footage to fit three bedrooms comfortably is this floor plan. 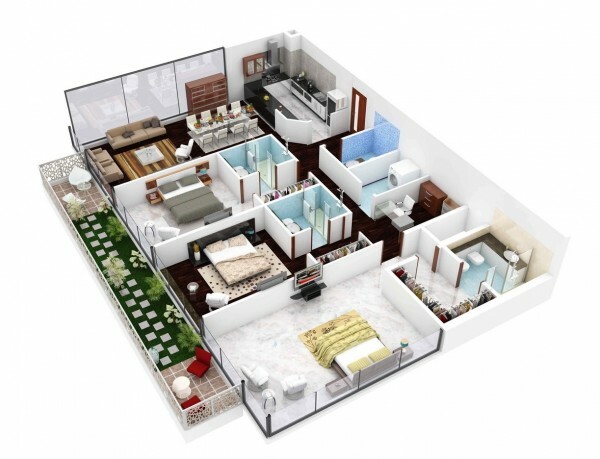 A master bedroom with ensuite bath and two smaller rooms for children and guests are perfectly spaced. Many homeowners may overlook the luxury of built-in closets, so this design makes stylish and practical use of freestanding wardrobes in each of its three bedrooms. 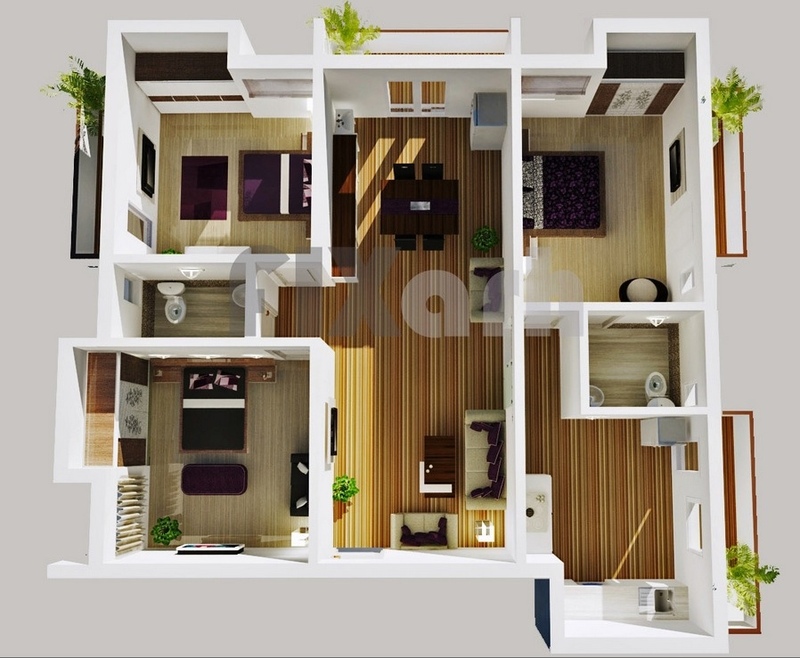 The simplicity of the furniture choices in this three bedroom apartment ensure that it feels extremely spacious, while still including all the necessities, like three baths, an office area, a dining area, a spacious kitchen and even a balcony. 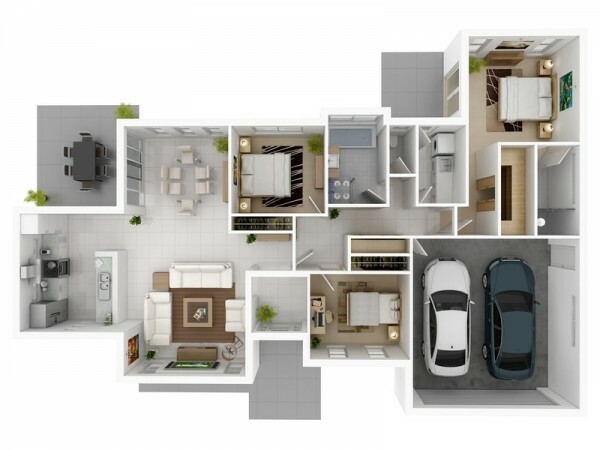 This design acknowledges both the importance of outdoor spaces and of privacy by giving each bedroom its own separate balcony and allowing residents to retreat to their own corner, or commune in the formal dining area and spacious kitchen. This three bedroom apartment is bright and airy though may be lacking in the storage department with only a few small wardrobes to speak of. 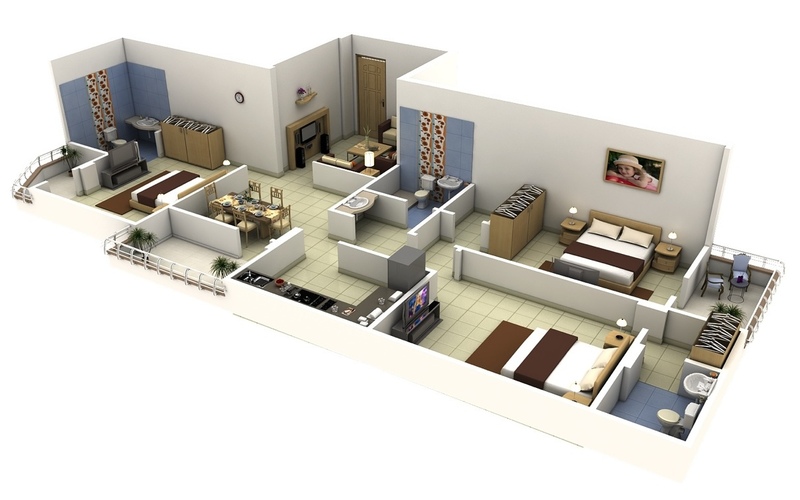 This apartment keeps the communal living areas separate from the bedroom flow, making it easy to maintain privacy when necessary. 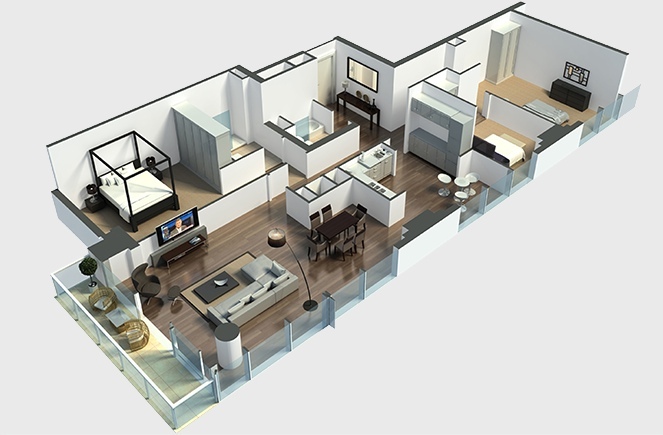 A three bedroom apartment with modern, unobtrusive decor makes for the perfect corporate suite or temporary housing for traveling executives. 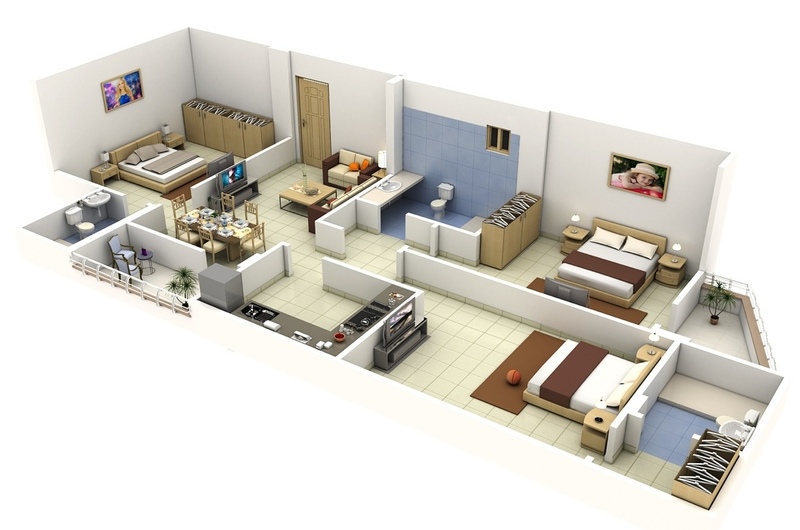 White tiles and floor-to-ceiling windows make this colorful apartment an ideal beach retreat for friends or family. 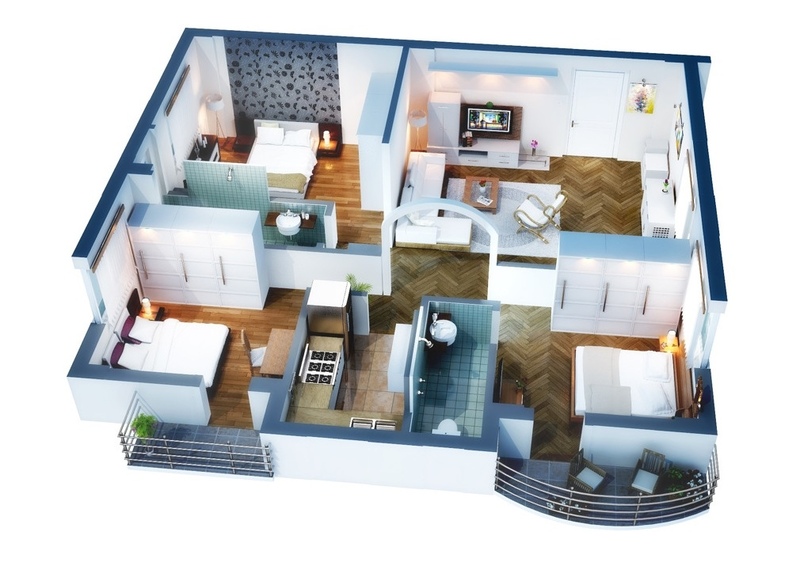 Each bedroom has it’s own private bath and multiple balcony areas leave plenty of room for soaking up the sun. 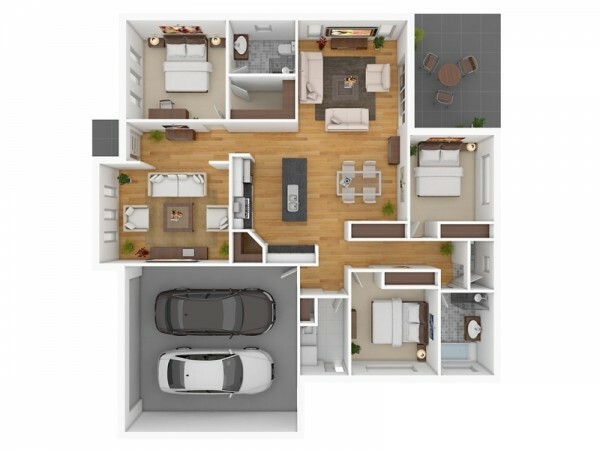 Each of the three bedrooms in this visualization have their own distinct personality, from floor treatments to bright wall coverings, encouraging individual expression. 3 Bedroom apartment with servant’s room. 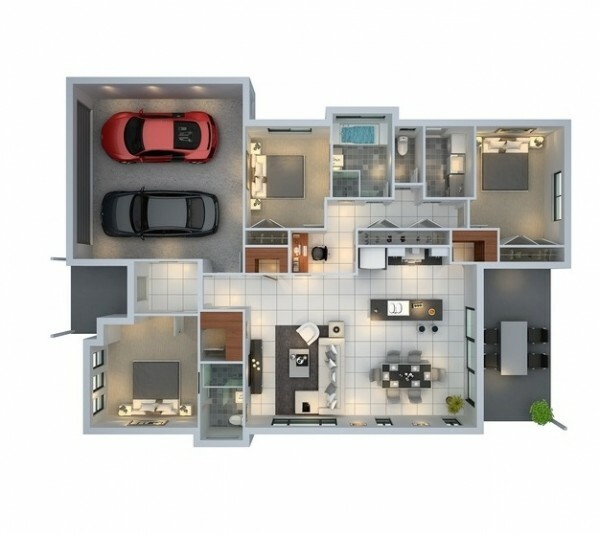 A vibrant, spacious terrace turn this three bedroom apartment into a luxurious option for any family. Carefully consideration gives this three bedroom design space for a two car garage and indoor as well as outdoor dining areas. 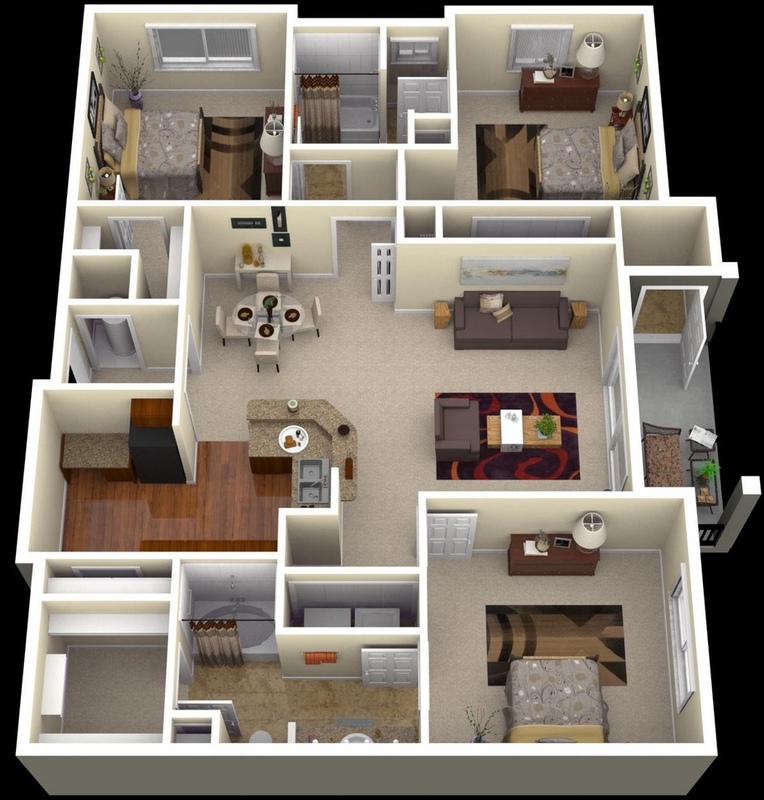 Built in closets and a separated kitchen make this three bedroom space both modern and comfortable.